This page is very specific to our installation at home. Potentially it can be of use to other people too, but that's not the primary intention. Comments like this in green are visible only when accessing the page externally. This page describes the new method of photo processing, using the E-PM2. The old way is described here. The photos will be installed in a directory ~/Photos/<date>/orig, where <date> is in the form YYYYMMDD. For example, on 24 April 2014 the directory would be ~/Photos/20140424/orig. While that is happeing, start a remote desktop connection to dischord via the left mouse cursor menu on the root window. This might take a while to start. 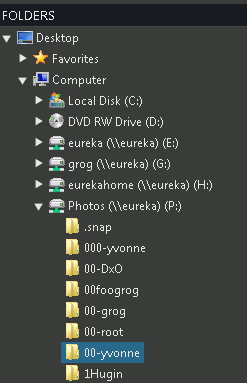 fordxo puts the files in the directory P:\00-yvonne, which Microsoft can access easily. The -d tells it to first remove what was already there, so don't use this if you have stuff in there that you haven't got out yet with fromdxo (see below). fordxo moves the raw files to a directory /Photos/00-yvonne so that I can just select all rather than mess around with a mouse in Microsoft style. /Photos is mounted as a CIFS file system. This doesn't make any difference to the processing. If dischord still hasn't come to life, try again. This time it should be fast. The background here is that dischord, running Microsoft “Windows” 7, takes so long to come out of hibernation that I need to retry. But this should no longer happen, since the connection retries automatically. If no images show, or the wrong images show, press the F5 key and wait a while. If still nothing happens, panic. From left to right, these are crop, dust removal, straighten horizon, force lines to be parallel, force a box, and white balance chooser. After preparing the image, press the Export to disk area at bottom right and then press Export . The image will be processed. fromdxo takes the processed images and puts them back where they belong, updating EXIF information as it goes. The contacts target creates a web page with “contact prints”, into which you can enter descriptive names, as shown below. The messages are normal. At the top, enter a description of the day's photos. Under each image, enter a name (without spaces). If the name ends in, say, -1, you can enter a comma in the next field and it will automatically be replaced by the same name with -2, etc. You can also enter a !, in which case the names will count up until the end of the page or the next place where you have entered text. converting orig/P4240143.jpg to chris.jpeg, rotation "0"
The two lines in the middle are harmless information messages. Note the number in the first line. You'll need it in the next step. This should be on dischord, but Ashampoo has completely broken itself there. 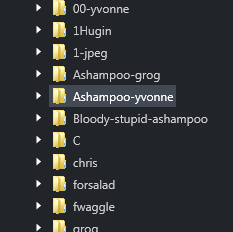 Select Bloody-stupid-ashampoo (below Ashampoo-yvonne) and wait until no images are displayed. Then select Ashampoo-yvonne and wait until the number of images displayed matches what you noted in the previous step (about 1 per second). 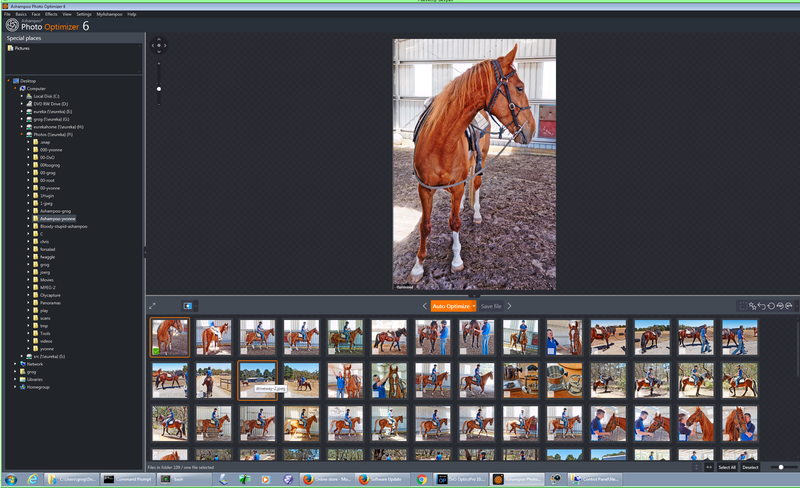 Press Ctrl-A to select all images and Ctrl-left button to deselect or reselect individual images. Then click on “Auto Optimize” and answer Yes to the question as to whether you want to Auto Optimize. Expect to optimize about 1.5 images per second. Press Return and wait until it finishes. Then go back to the contacts web page and select “Optimization Comparison”. The image on the left of each line is the unoptimized version, the image on the right the optimized version. Run the cursor over the left image to see the difference. If any of the optimized versions are not OK, ask for help. This makes the web page and associated files. When it's done, you can look at the page with a browser. These targets create a directory hierarchy including three different sizes of each image, along with information to generate a web page to display them.